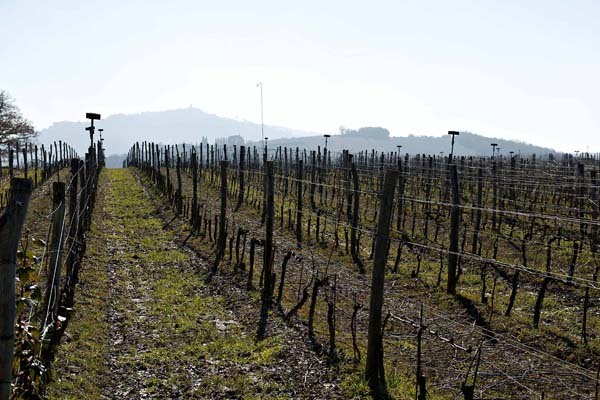 This up-and-coming Brunello producer isn’t the only winery using music in its vineyards. At De Morgenzon in Stellenbosch, Hylton Applebaum pipes composers such as Bach, Corelli and Albinoni into his rows of Chenin, Shiraz and Cabernet Sauvignon. As someone who set up Classic FM in South Africa, he knows about music, and presumably has an extensive CD collection. He, too, says that his vines respond to a particular type of classical music – harmonious Baroque and Early Classical. Play them a piece of rock, pop, rap, techno or jazz and it doesn’t work. The same goes for choral music. Words, in whatever language and style, don’t cut it. The link between music and plant growth is borne out by scientific research, although it seems to point towards the effectiveness of relaxing classical music, which has been found to trigger a response in two specific genes of rice, as well as promote root growth in onions during germination. Will other wineries adopt the same model as Il Paradiso di Frassina and De Morgenzon? The cost isn’t prohibitive – just a sound system, a few speakers and several miles of cable – but it’s probably a little too left field for most. And yet it’s no wackier than biodynamics, and arguably has a greater scientific foundation. Vineyards are not the only place where music and wine meet. The connection between the two might seem distant – like “dancing about architecture” as Elvis Costello once put it – but music changes our mood and, according to Professor Adrian North of Herriot Watt University, the way we purchase wine. Music can be used to manipulate how much we spend on wine, too. As classical music is associated with thoughts of “sophistication and affluence”, playing it in a wine store can encourage punters to buy more expensive bottles, just as a piece of throw away pop could have them reaching for the gondola end. Professor North is convinced that music influences the way we taste wine, too. In a study he did for the Chilean winery, Montes, a few years ago, he found that, based on the responses of 250 adults, “the specific taste of the wine was influenced in a manner consistent with the mood evoked by the music” and that “the magnitude of these effects was not insubstantial”. To coincide with a Simon Callow-hosted show called Tasting Notes that Classic FM did in conjunction with Laithwaite’s wine last year, I was invited to try a handful of wines while listening to different pieces of music. I’d love to say that I agree with Professor North, but my response to the vino was the same, whatever was playing in my ear. I suspect there are two reasons for this. First, I’m a professional wine taster, so am more likely to focus on the liquid in the glass. And second, I regularly listen to music on my iPod while I taste, which means I’m used to combining the two while keeping them separate in my brain. But maybe that’s because I choose the music, which is invariably classical or jazz, nearly always without words. Force me to listen to rap or heavy metal, both of which I dislike, and my perception of the wine might change. Like those vines at Il Paradiso di Frassina, I prefer Mozart to Motörhead and Missy Elliott. Next post: Better Off Dead—New Wine Books!